It's so memorable that after the attacks on 9/11 and the collapse of the World Trade Center's twin towers, the planners of the project to rebuild the site and restore the skyline of lower Manhattan chose 1,776 feet to be the height of the new building that would stand as the project's centerpiece. Nicknamed the Freedom Tower, it is meant to stand as a symbol of America's power, strength, freedom and ability to bounce back as a nation. So, how tall is the Freedom Tower? The truth is, it all depends on how you look at it. You see, there are two heights - one is 1,776 ft. and the other is 1,792 ft. Why are there two heights and which one is correct? The task of measuring a building's height is far from simple, contains quite a few variables and is actually calculated in a number of different ways. Technically, both measurements are right. For starters, there is an organization called the Council on Tall Buildings and Urban Habitat (CTBUH) and they are known as the authority when it comes to the heights of skyscrapers. The first of these measurements is the what you generally see when a building's height is listed. If you've ever seen charts or pictures showing the tallest buildings in the world, they are all judged by the height to their "architectual top." So... what is the architectual top? The CTBUH says, "the architectural top of the building, including spires, but not including antennae, signage, flag poles or other functional-technical equipment." 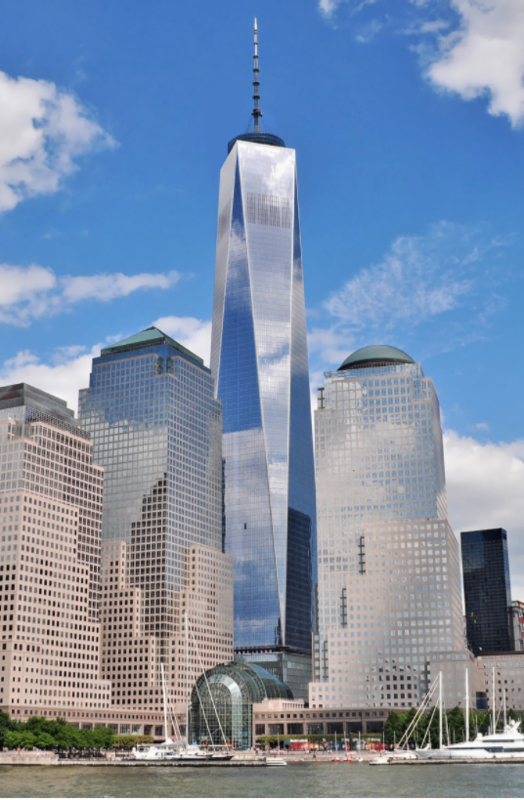 By that standard, the Freedom Tower is 1,776 feet tall. The second standard of "the highest occupied floor" is obviously lower and is measured at 1,268 ft. which happens to be lower than the Willis Tower in Chicago which has a highest occupied floor height of 1,354 ft. Finally, the "height to tip" (which is what I'd naturally assume is the most recognized figure) is where the second figure in the google search comes from and for the Freedom Tower is listed at 1,792 ft. However if you want to get technical there's the issues of fluctuations in the building, it settling with the added weight of tenants moving in, masts that allow sway, contraction and expansion and end up changing length, etc. I'll just leave that up to you to decide.